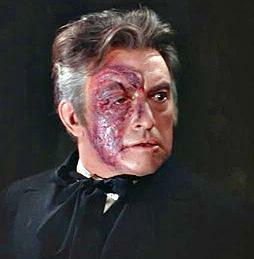 Phantom of the Opera Admits He was “A Little Bummed” About His Face but Things Are Looking Up! I am ugly. So f*cking ugly. The so-called “Phantom of the Opera” admitted today that life as the famous phantom isn’t all people assume it’s cracked up to be. “Let’s just say it’s been one long downward spiral for me” said the Phantom. I used to be a violinist at the Paris Opera House. The money was good, the music was good and talk about the women! I was getting so much action. But then I started to lose the use of my fingers and got laid off. I had no savings so I write a concerto to get some cash. But the concerto was stolen. Long story short my face was horribly disfigured by acid and I moved to the sewers to escape the police. Did you ever try picking up women when you tell them your place is in the sewers? They react like I told them I live in Washington Heights in upper Manhattan. And that is even before they ask me about the mask. Despite not being able to play violin anymore, not having a job or any money, not living in a nice apartment above ground and with a horribly disfigured face, the Phantom at first tried to lead a normal life. I needed a job so I started putting my resume out. But when I went on the interviews and they saw my face I was immediately rejected. I had one HR girl cry and tell me that she would have to retreat to her safe space. It turns out that with my ugly, heavily burned and disfigured face the only position I could get was as a Help Desk Technician. Turns out most of them are pretty ugly so I fit right in. But I quit because I didn’t like the clients. It was after quitting his job at the help desk that the Phantom started getting work at Comic Cons. 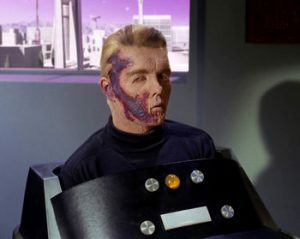 Turns out my horribly disfigured face was a match for Christoper Pike from Star Trek. Hey baby you want to roll in the hay? So I did the Comic Con circuit for awhile. When I sat in the chair I really got into character and became Pike. When I told the organizers I didn’t need makeup because my horribly disfigured face was real they would just say “Wow. This guy is so into it.” They also seemed happy that they didn’t have to pay for makeup. It was a job. Still no women though. And I didn’t really like the nerds who attended those conventions. That’s why I stopped going to the Comic Cons. After leaving the Comic Cons the Phantom started to feel sorry for himself. It was at his lowest point that things began to pick up. I saw an ad in the paper that specifically asked for “horribly ugly or disfigured people.” Well I certainly qualify. I had no idea what it was for but I figured I’d give it a shot so I showed up for an interview. It turns out it’s to play the role of Neil Young in a Neil Young and Crazy Horse tribute band. I got the job! Who knew having such an ugly, horribly disfigured face would come in handy. The Phantom can now be seen touring America with the tribute band. Stop bitching Phantom. With a face looking like a stretch of the LIE outside Lefrak City Chelsea Clinton still gets multiple invitations to ride the baloney pony. Yes but Chelsea also belongs to one of America’s most powerful and feared crime families. It’s all a larf until you wake up and there’s Neil Young, “doing” your girlfriend. Thanks a lot, “Neil”. The Phantom’s just looking for a heart of gold, that’s all.